Future Hosting take pride in offering a great service with an additional features found nowhere else. The company offers multitude services from Virtual Private Networks, Dedicated Servers and back ups, SSL Certificates, Future Protect™ and Future Engineer™ in a global environment. 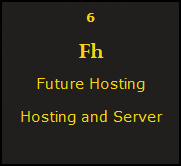 Moreover Future hosting provides 24/7 service through the client portal. The wide array of services makes it that Future Hosting can provide most services that a business will need in terms of managing servers and networks. The company have a hard line tag line that matches its ambition and prospective expansion which are scalable, powerful and global. Future Hosting have a scalable pricing strategy which aims at making its services to a different purses. The company partners itself with many Internationally renowned brands such as Dell, Jupiter, Parallels and Interior just to state a few. With such a strong position, it is without doubt that Future Hosting have made the steps for what looks ahead to be a beautiful journey.